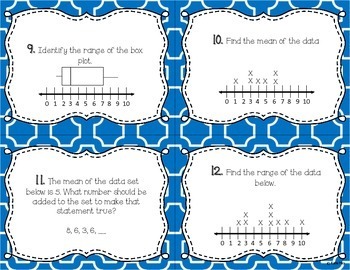 Get your students engaged with this set of 20 task cards! 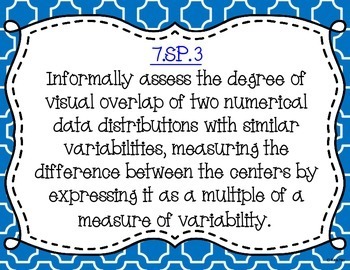 The set is aligned with common core standard 7.SP.3&4 which can be easily printed using the standard poster. 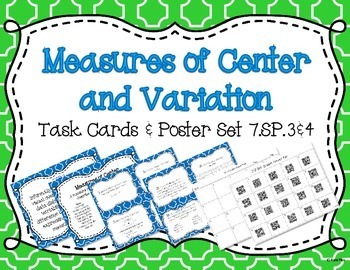 Students can use the 2 content posters to help them determine how to identify and solve measures of center and variation using different strategies when solving the 20 task cards. Task Cards are a great way to incorporate collaborative learning (partners, peer tutors, etc) and assess learning. After students complete the activity, allow students to check their own answers and then share whole group common misconceptions or errors. This will continue to place the focus on learning in your classroom. You can use these task cards two different ways. The first way is the traditional task cards, in which you can use as a whole group, station, review or remediation. The other way is geared to the 21st century learner~QR Codes. There are two student response pages and two answer sheets (traditional and 21st Century). 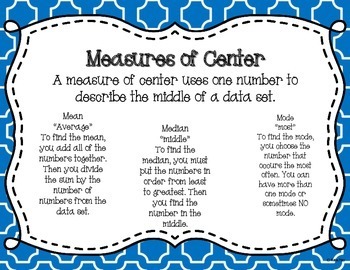 This provides immediate feedback for the students to correct their mistakes. Please go to your "My Purchases" page (you may need to login). Beside each purchase you'll see a "Provide Feedback" button. Simply click it and you will be taken to a page where you can give a quick rating and leave a short comment for the product. I value your feedback greatly as it helps me determine which products are most valuable for your classroom so I can create more for you. Also, each time you give feedback, TPT gives you credits that you use to lower the cost of your future purchases! Be the first to know about my new discounts, freebies, and product launches. Look for the green star near the top of any page within my store and click it to become a follower. Also follow me on social media to more about my products and classroom!